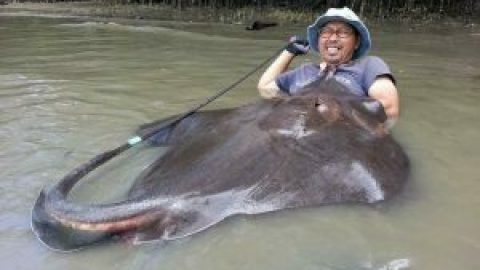 Krister from Sweden and two friends visited the prolific IT Lake Monsters predator fishing in Thailand. On arrival at the lake the anglers started fishing with artificial lures which they cast at the many showing predators out in the lake. After several retrieves an Alligator Gar slammed into one of the lures heralded the start of the days sport. After a short but spirited battle the Alligator Gar was brought to the waiting net before being hoisted onto the grassy bank for unhooking. Further casts by the Swedish anglers resulted in a few more Alligator Gar with relatively low weights ranging between 8-10kg’s in addition to several Pacu. A changeover to deadbait in the afternoon saw sport take an upturn with all of the anglers landing Redtail Catfish with weights ranging between 10-20kg’s. Fishing with free lined deadbait’s the anglers started picking up some bigger predators with more Redtail Catfish nudging 25kg’s in addition to one or two Asian Redtail Catfish. As the days Thailand predator fishing continued the anglers caught steadily throughout the day all catching into double figures. The highlight of the day for Krister saw him attached to a hard fighting Arapaima which took a liking for his mackerel fillet deadbait which breached out of the lake on several occasions before finally being netted. 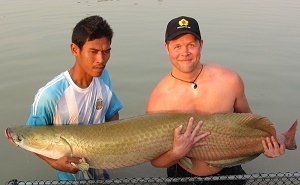 The Arapaima was estimated to weigh 25kg and was released after photography and a short period for recovery in the holding pen.